Cairn Terriers were developed in Scotland on the Isle of Skye, where Captain Martin MacLeod is credited for developing this little dog. They are named after the loose pile of stones, called cairns, that were used to mark graves and property lines where there were always a lot of vermin for the Cairn to hunt. All terrier breeds in Scotland were originally classified as Scotch Terriers. A new system was created in 1873 that separated the two classes – Skye Terriers and the Dandie Dinmont Terriers. Cairn Terriers fell into the classification of the Skye Terriers, as well as Scottish Terriers and West Highland White Terriers. These breeds were distinguished then only by their color, as all three could come from the same litter. 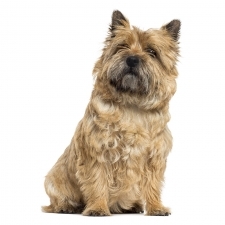 In 1912, the Cairn Terrier was designated as its own breed and was imported to the United States in 1913. Cairn Terriers make wonderful family pets. They’re fun, entertaining, happy, cheerful, and they truly love being with people. They are very devoted to their family, especially the children. Cairns are curious, quick to learn, and have an abundance of energy. They are alert, active, inquisitive, feisty, and fearless. However, they are a sensitive dog. Their feelings can be easily hurt, and they don’t respond well to scolding or harsh commands. Cairns love to learn, and there isn’t much that they can’t master. They make good watchdogs, as they’ll sound the alarm when visitors approach. Cairns are great pets for anyone who wants a loving and devoted dog. Cairns usually weigh between 14 to 16 pounds and stand approximately 11 to 12 inches tall. They are a small dog with a compact and powerful body that is very strong for its size. Their coat is slightly long and shaggy and comes in a range of colors from cream to gray to black. The most famous Cairn Terrier ever was Terry who played Toto in the movie The Wizard of Oz. She was paid 12 dollars a week and was owned by trainer Carl Spitz. She lived to be 11 years old.